Auto Safety Center has performed auto brake repairs in West Bend WI at an affordable cost since 1965. Our combination of the latest high tech equipment, the best ASE Certified Technicians, and 45+ years experience offers you unbeatable value and a brake repair done right - guaranteed! We only use high quality brake parts to ensure best value, long brake life, and your complete satisfaction. You benefit from the part cost savings we have earned from our long term brake part supplier relationship. Harsh winter conditions and road salt causes rust and corrosion of brake parts leading to rapid rear brake wear and total brake failure in extreme cases. Routine brake inspections ensure a safe vehicle. Regular brake inspections and lubrication can prevent expensive parking brake repair and warn of needed rusted brake line repair. 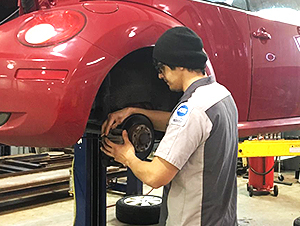 Auto Safety Center performs all auto brake repairs in West Bend WI including ABS brake repairs, anti lock brake repairs, auto brake job, brake pad repair, brake line repair, and general auto brake service. We road test your vehicle before and after any brake work. First to check brake performance and discovery any problems. Second as quality control to ensure your brakes are performing correctly. We perform a thorough visual inspection of your brakes. Our thoroughness often reveals problems before they become larger more expensive issues. We measure brake pad and brake shoe thickness to provide you with an assessment of expected life remaining. We provide an honest assessment of the condition of your brake system. From our inspection we will give you an estimate of remaining brake life and any recommended repairs. Often the number one reason people request a brake inspection is a grinding noise when applying the brakes. Noise is often an indication it is time for brake pad replacement but not always. We are honest in our brake inspections and will advise you if the brake noise is just a nuisance or an immediate need for brake repair. We are Certified Auto Technicians first and brake specialists second. No inexperienced people doing auto brake repairs that are critical to your safety. We are trained and experienced in all aspects of repairing your complex vehicle. We know what is required to do a safe brake repair that will last. And we won't push work that is not needed. Our extensive experience and training allows us to judge where we can save you money AND make sure the brake job is done safely. Our brake disc resurfacing lathe allows us to refinish brake rotors and brake drums to our exacting standards to give you the best value and brake job possible. Some shops who do not have their own equipment will just replace worn discs or drums with new, expensive parts. We can save you money by refinishing your brake parts that are still usable. The right equipment in the hands of the right technicians equals the best value for you! Quality brake parts make a big difference in brake performance and customer satisfaction. Our quality brake pads last longer, stop better, and remain quieter longer. One of the most common complaints with brake service is brake squeal noise. We go to great lengths with our procedures and parts selection to keep brake noise problems to an absolute minimum. Our Brakes Pads and Shoes are covered for Life! Our pads and shoes come with a lifetime warranty. Covered against WEAR OUT for as long as you own your vehicle. Truly the last set of brake pads you will buy! 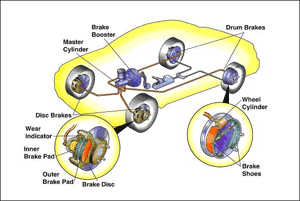 Auto Safety Center performs all brake repairs including brake master cylinder repair in West Bend WI. The brake system is the most important system on your vehicle. Routine brake inspections and maintenance are extremely important. Brake pads are a normal wear item for any vehicle and eventually they will need to be replaced. Routine brake inspections can save you money in the long run by preventing damage to expensive parts such as your brake rotors, brake calipers, and ABS brake system. The brake system is composed of two systems: friction materials and hydraulics. 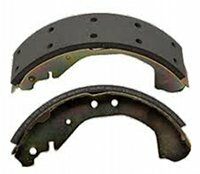 Friction materials, brake pads and brake shoes, normally wear with use and require periodic replacement. The hydraulic system, brake master cylinder, brake lines, control valves, brake calipers, and wheel cylinders, all deteriorate with age and require routine maintenance. Just like oil changes, brake maintenance will determine the long term cost of your brake repairs. Regular brake inspections and maintenance will also ensure when your foot hits the brake pedal your vehicle will stop! Brake system component diagram shows complete brake system with disc brake pads, brake calipers, brake rotor discs, brake master cylinders, power brake booster, brake hoses, brake lines, drum brake shoes, wheel cylinders, and parking brake system. When you push on the brake pedal, the master cylinder creates hydraulic pressure which pushes brake fluid to each wheel and activates the brakes. Parts in the master cylinder eventually wear out and can be damaged by not flushing and renewing the brake fluid. 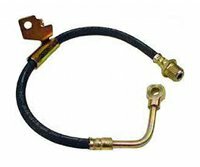 Steel brake lines and high pressure rubber hoses transmit the pressurized brake fluid throughout the brake system. Both brake lines and brake hoses deteriorate from the outside and inside. Rust attacks metal parts and rubber parts rot with age. They are also damaged from brake fluid contaminates such as moisture. Expensive brake hose replacement and brake line repair can be prevented by regular brake fluid flush. Auto Safety Center performs all West Bend WI brake repair including brake hose replacement in West Bend WI. Brake calipers and wheel cylinders are hydraulic cylinders that transmit pressure to the friction materials (brake pads) and cause your vehicle to stop. These parts do wear out but their service life can be greatly extended by regular brake fluid flush. The metal and rubber parts can also be damaged by brake fluid contaminates such as moisture. Expensive brake caliper repair and brake wheel cylinder repair can be prevented by regular brake maintenance. The brake booster provides increased braking power with minimum brake pedal effort. 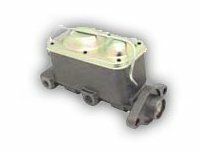 The power brake booster is located between the brake pedal and the brake master cylinder. If the brake booster malfunctions the driver will notice a significant increase in the brake pedal force required to stop the vehicle. 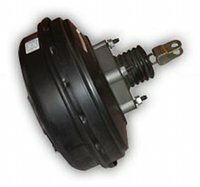 Due to the complexity and special tools required defective brake boosters are exchanged for a factory rebuilt unit rather than doing an individual brake booster repair. Auto Safety Center performs all brake repairs including brake shoe replacement in West Bend WI. Auto Safety Center performs all brake repairs including brake pad replacement in West Bend WI. Brake linings are composed of high temperature materials that create the friction that stops your vehicle. They normally wear out with use and require periodic replacement. Brake lining life differs greatly and depends greatly on vehicle use and replacement part quality. Lack of brake maintenance can cause shorter brake life and decreased fuel economy. Auto Safety Center performs all brake repairs including power brake booster repair in West Bend WI. 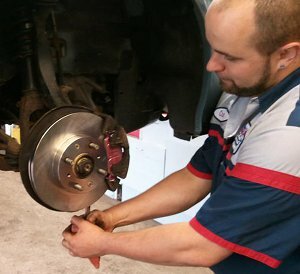 Auto Safety Center performs all brake repairs including brake rotor replacement in West Bend WI. Disc brakes consist of a Disc Brake Rotor attached to the wheel and a Brake Caliper which holds and applies the Disc Brake Pads. Hydraulic pressure from the Master Cylinder causes the Brake Caliper Piston to clamp the Disc Brake Pads onto the Disc Brake Rotor. This creates friction between the brake pads and rotor causing your vehicle to slow or stop. 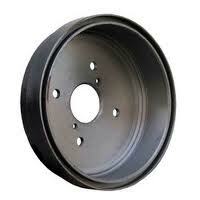 Drum brakes consist of a Brake Drum attached to the wheel, a Brake Wheel Cylinder, and Brake Shoes. Hydraulic pressure from the Brake Master Cylinder causes the Wheel Cylinder to press the Brake Shoes against the Brake Drum. This creates friction between the brake shoes and drum to slow or stop your vehicle. Auto Safety Center performs all brake repairs including brake drum repair in West Bend WI. The Parking Brake uses cables to mechanically apply the brakes to prevent the car from rolling when not being driven. Common park brake problems are seized cables from rusting and resulting brake drag which causes rapid brake lining wear out and possible brake failure. Routine brake maintenance can prevent park brake problems the resulting costly damage and safety hazards. Anti lock brake system (ABS) is a safety feature that prevents the vehicle's wheels from locking and causing a skid. The ABS brake system is comprised of wheel speed sensors and computer controlled hydraulics that rapidly pulse the brakes on and off which allows you to maintain vehicle control while reducing speed in extreme braking situations. Routine brake fluid flush can prevent internal corrosion of ABS parts and very expensive repairs. Auto Safety Center performs all brake repairs including anti lock brake repair in West Bend WI. Brake fluid replacement is a simple, inexpensive procedure that has been proven to prevent expensive brake system repairs. With the complex brake systems on modern vehicles it is cost effective to regularly do a brake flush. Brake fluid is an alcohol based liquid with a clear, slippery consistency. Due to its alcohol base, brake fluid absorbs moisture from the air. Over time the moisture level in brake fluid increases and causes corrosion of metal parts in the brake system. The sludge created by the corrosion can cause ABS brake system problems when it plugs small passages and valves. To prevent damage of expensive brake parts brake fluid needs to be regularly flushed and replaced with new brake fluid from sealed containers. New brake fluid is clean and clear. Dirty, neglected brake fluid looks like used engine oil and can compromise the performance of your brake system and cause severe, costly damage. If you haven't serviced your brake system lately, now's the time. Auto Safety Center performs brake repairs, brake hose replacement, brake master cylinder replacement, brake fluid flush in West bend WI. 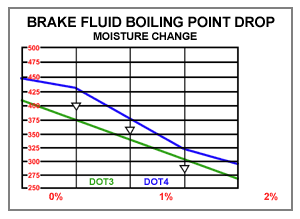 Moisture also decreases the boiling point of brake fluid. Under high demand brake use, such as steep hills, trailer towing, or emergency stops, the extreme high temperatures generated can cause your brake fluid to boil. This condition can lead to a dramatic decrease in braking power or even total brake failure. 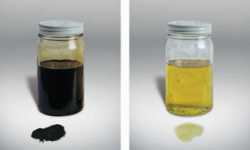 Oil, such as motor oil, transmission oil, power steering fluid, etc., is not compatible with brake fluid. If oil is added to brake system by mistake it will destroy all rubber parts in the brake hydraulic system. Even a few drops can severely damage the brake system and cause total brake failure. Repairing an oil contaminated brake system will require overhaul or replacement of all parts in the brake hydraulic system. Brake fluid flush should be done every two years. Brake fluid moisture contamination takes place regardless of the amount your vehicle is driven. Next to changing your motor oil, a regular brake inspection and brake fluid flush can extend the life of your vehicle and decrease brake repair costs.